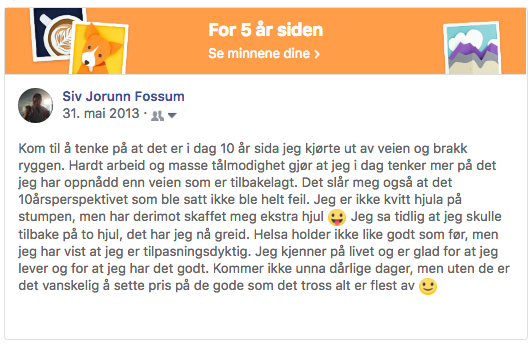 For those of you who not read Norwegian I wrote about that I like to focus of what I have achieved not the way I have achieved it. It has been hard times and bad days, but without them it is hard to appreciate the good ones. Today it is 15 years ago since my accident that made me use a wheelchair in daily life, and I am still able to see what I have achieved rather than not. Thru hard work and positive thinking I have come so far! In this post, the first post for a long time, I want you all to sit down, breath and clear your mind. Focus on three good things in your life right now, and write them down. This is something you should do every day! Instead of just focus on today, I wish to look back of my 15 years in wheelchair. From the first day in the hospital I felt lucky to survive, and I had good people around me that helped me to focus ahead of a new beginning in life. And what a life! Both sorrows and great happiness, all together helping me with the perspective of my life. Luckily I have a strong and positive mind that forget easily... maybe you are not follow when I say that forgetting things are a luck, but for me it has been really important to be able to forget all the hardest episodes in my life. For sure, they are there, some place deep, but I have worked it out and found my way of living my life. The hardest episodes in my life have given me the right perspective so I can appreciate the simple and good things my life is full of, that also your life is full of! the sea, feeling the sun warm my face and body. I am able to enjoy - my own company, an exciting book or a great movie. I am able to enjoy - my laziness and my energy. I am able to enjoy - creating projects for me and for others. 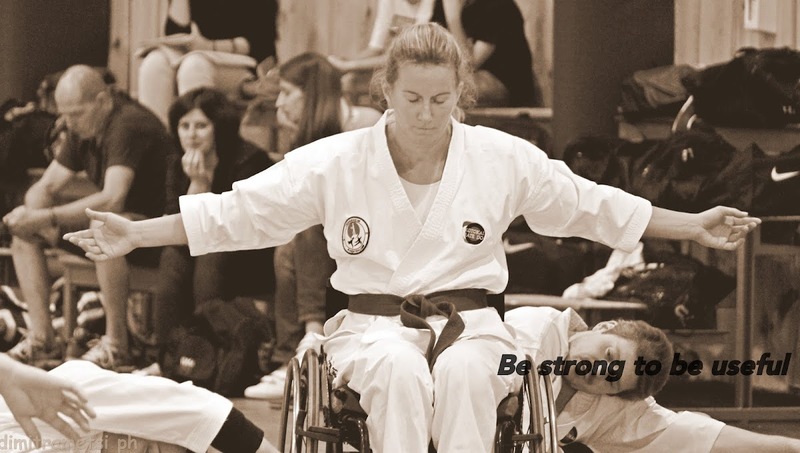 I am able to really enjoy - activities like training martial arts in a wheelchair.